Loop-the-Loop with a Flying Hoopster #makereducation « Adafruit Industries – Makers, hackers, artists, designers and engineers! Paper airplanes are fun to make and fly. Most designs resemble miniature planes—made of folded paper, with wings, stabilizers and sometimes even flaps. These creations look like they are ready to soar. There are some designs, like the one you can try in this activity, however, that look so awkward one might imagine they would not fly at all. Find out if it will really soar! Although there are many different paper airplane designs, almost all of them have a flat winglike structure, which, like a traditional plane, helps create lift to keep the plane in the air. 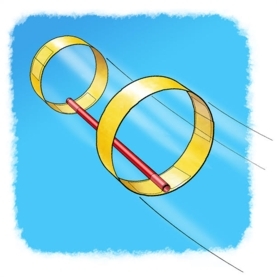 The plane in this activity, which is reminiscent of Phillip Swift’s design entered in Scientific American’s International Paper Airplane Competition in 1967, gets the lift needed to glide from two rings, instead of wings. Normal wings have wing tips that generate vortices, adding drag (which isn’t ideal for an object trying to stay aloft). The lift-providing rings have no wing tips and so they have less drag. The streamlined shape of the “hoopster” also makes it easy to throw accurately.